One client sells a popular item in the live auction. It’s the chance for eight people to dine at a nice restaurant with the Head of the School. Fine wines are served and the food is spectacular, but the real draw is the chance to enjoy a meal with the popular headmaster. It’s a clever play on words. Since the word “Groupon” has entered our vocabulary around 2009, many of us know a Groupon to be a deal-of-the-day recommendation. Groupon (the company) emails out a coupon for a store or restaurant, offering a substantial discount if you purchase the deal. Simply put, it’s a coupon sent to a group of people. Though discounts vary, often the deal becomes active once a certain number of people commit to buying, and it’s closed once it hits a maximum threshold of buyers. The interest of the group propels the popularity of the deal. At your benefit auction, sale prices escalate when bidders organize to buy items as a group. If you’re wondering how to get higher bids on items, this can be one area to examine. For example, earlier this month at a school auction, I sold a Lower School Hip Hop Party. It was the chance for one grade (kindergarten through fourth grade) to take over the gym, which would be turned into an impressive night club for kids. Each grade had an assigned ambassador bidding on its behalf against ambassadors from the other lower school grades. Wow, talk about a well-organized “group-on!” Parents submitted their bids to their grade ambassadors in advance of the auction. Some parents discussed “stretch bids” that could be used, only if bidding exceeded what they’d hoped. This concept was again used later in the auction, when we sold the chance for one of the middle school grades to spend a school day at a nearby amusement park. Once again, Ambassadors became the official bidding representatives of their grade (5th through 8th grade) to buy the item on behalf of their grade. More often, organized group bidding is spontaneous. Groups of people might discuss bidding on an item in advance of the auction, but it’s not formally submitted as a bid to an ambassador. For instance, at an all-girls middle school auction four years ago, I sold a lock-in overseen by two teachers. The lock-in consisted of one grade of girls having a sleepover on a Friday night in the gym. Two popular teachers would chaperone the evening, providing games, food, and movies. As the bidding progressed and it became apparent that initial price discussions wouldn’t secure the winning bid, parents began running table to table, organizing their bidding to ensure their daughter’s grade won the final bid. School auctions are rich with examples of group buying, but this behavior can also be fostered in nonprofit auctions. Large vacation homes that accommodate multiple families, or dinners and cocktail parties that accommodate several couples, often become group buys at an auction. As an auction planner, it’s to your advantage to encourage group buying. Winning bids will be higher when multiple bidders pool their money to buy an item. What can you do to foster bidders to get a “group-on?” Here are some tips. AT THE BENEFIT AUCTION: (See photo.) 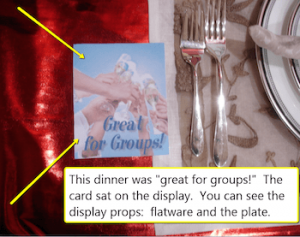 Use sticky note marketing to remind guests when an item is good for group buys. “Great for groups,” your sticky note or notecard states. Watch this video for sticky note marketing ideas. Fostering group buys raises sale prices. If guests talk about buying an item with a friend before the bidding begins, they’ll be better prepared to pay a higher amount for it onsite. Do your part by pointing out those items appropriate for group bids.